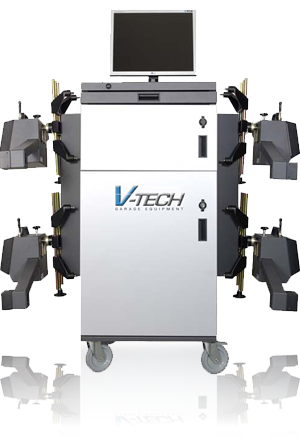 The V-Tech 618i is a new generation of Wheel Alignment. All angles are measured by means of the 8-sensor CCD camera system with a measuring range of +/- 25 degrees – we call it 20/20 vision. No electronic turntables are needed since the caster swing is measured at 10, 14 or 20 degrees for high accuracy by use of the CCD camera. Measurements and adjustment illustrated in Super VGA colour. All measuring data and specifications from before and after adjustment on one screen. Electronic Level displays the level on-screen and also on the measuring head. This assures that faults in the operation are avoided. 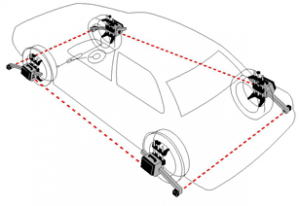 AThe Quattro measurement system has 8 Toe-sensors so the vehicle is framed on all four sides. It is therefore possible, besides all Toe angles, also to measure Rear Axle Setback, Side Offset, Axle Offset and Wheel Base. Also a continuous check of the accuracy is performed. The system assures that compensation for Run-Out is performed continuously. Even when the wheels are rotating after compensation is done all angles is measured correctly. 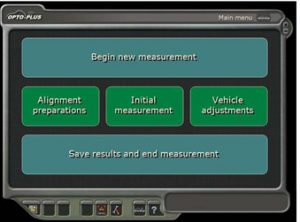 During compensation the level is shown on-screen. The software is a very important feature of the wheel aligner – OPTO-PLUS stands for simple design and easy to operate – therefore the OPTO-Win (software for OPTO-PLUS wheel aligners) is simple in design and very easy to use. The OPTO-Win offers a simple procedure that all mechanics can operate after a 5-minute introduction. Even mechanics that has tried the OPTO-Win once and returning after 3 months without operation can operate the software. Databank with more than 10.000 specifications. Changes in existing data or data for an unlimited number of new cars can be typed in via the keyboard. Program and data are stored on a hard disk. The database is updated via the CD ROM drive. Adjusting of Camber and Caster with the cars in lifted up position so it is easier to adjust specific car models. Customer databank with complete records of earlier measurements. Measurements result from before and after adjustment. Casterswing on 100 , 140 and 200 can be selected. 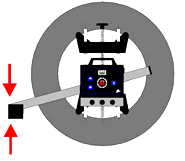 Equipment can be controlled from all 4 measuring heads. On-line Pop-Up Help for all measurement and system functions.